Save on the most advanced editions of the NEC®, NFPA 70E®, and NFPA 70B. Depend on the state-of-the-art "Big 3" set to help protect people and property from electrical hazards. Make sure you stay in compliance with the three most critical documents for commercial and industrial electrical work: the National Electrical Code®, NFPA 70E, and NFPA 70B. Use these NFPA documents to help ensure installations are safe and code compliant, safeguard personnel from electrical hazards, and maintain equipment to avoid costly breakdowns. Don't work with out-of-date resources. 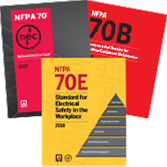 Order the tools you need to help safeguard people and property from electrical hazards with the NEC, NFPA 70E, and NFPA 70B Set.